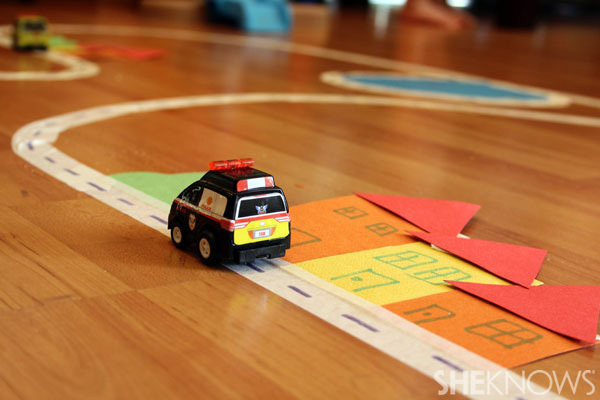 Perfect for a rainy day, this masking tape car track comes together within minutes with a roll of tape, some coloured paper and a few textas. It’s happened before; your kids are stuck inside and they’re bored. They’re tired of all their toys (and so are you!) and they don’t want to play with anything. Well. Time to turn yourself into super mum with this super-easy, cheap and fun way to breathe new life into the dozens of toy cars you have littered around your house. And if you’re not the mother of a little boy then you can turn this race track into a garden path for ponies with just a little bit of imagination. Clear a space on the floor. Carpet is fine, and if you’re happy to go off-road, consider making your track run over the sofa and coffee table as well (if you’re using masking tape it will peel right off!). Cut out some shapes from the coloured paper. Think houses, bushes, ponds, castles, villages, dragons… the list is endless! If you’re making your track for toddlers, put these aside until you’re ready to make your track or if this is a project for older children, keep them busy decorating the shapes with textas or crayons. Map out your track with a piece of string or just wing it. Run the masking tape in a single line around your track, pleating the corners as necessary. As you go, tape down the houses, bushes and lakes you have cut out of the coloured paper. Join up the ends. If this is a car race track, make sure you put line markers down the centre of your road for added visual affect. 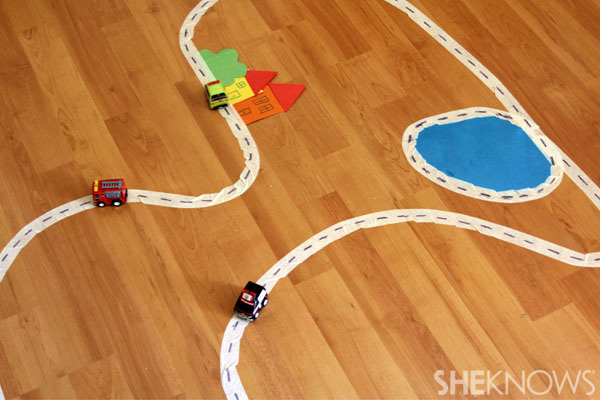 Scatter with toy cars, ponies, planes and boats and let your children give their imagination a workout!